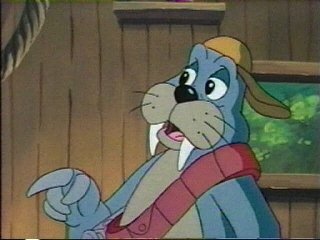 As some of you may know – I keep a running search for “walrus” going on Twitter (via a column in Tweetdeck). As a result, I see many many tweets about walruses, or featuring the word walrus. After some time of doing this, I have determined that there are certain walrus-related tweets that it’s time to hang up for good. Seriously, you have no idea how many times some of these are tweeted. 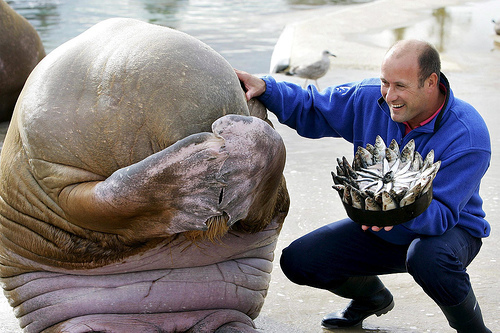 TIE: “I am the walrus” and tweets related the the “bashful walrus and the fishcake” picture, above. To prove my assertion that these are overused – I didn’t have to type any of those, I just opened a tab with Tweetdeck and there they were, all re-posted within the last 24 hours or so! In other news, when did “dying walrus” become the go-to metaphor for really bad singing? It was good fun while it lasted but it’s time to move on. The above tweets have long since jumped the shark, er… the walrus. Do you have suggestions to add? This morning brings us another endless stream of people Twittering the chorus of “I Am the Walrus”. It is continually amazing to me how many people all over the world, in several languages, feel the need to tweet some permutation of the phrase “I am the Walrus”. Another thing that amuses me is how people are spelling whatever it is that the Beatles laid down as the final phrase in the chorus. My interpretation has always sort of been “Koo Koo Ka Joob”, but here are a list of five current versions of this lyric on the Twitter just now. Of those, today there seems to be worldwide consensus on “Goo Goo G’Joob” which I haven’t seen much recently but is very common this morning. A week ago, around John’s birthday, it was different. I’m not sure why this has captured my interest this morning, and sorry it’s not ‘really’ walrus related but there you are!